Fill your home with warmth and character with our stunning collection of hardwood flooring in Highland, IL. Our well-known and respected store has the most competitive hardwood flooring prices in the area, and professional hardwood flooring installation to help you get the right fit for your home. The amazing thing about hardwood is the fact that it seamlessly combines elegant style that is fit for a mansion, but has a rustic charm that is suitable for any environment. Wood looks good in any home, regardless of size or décor. That is why it has been the flooring of choice for many homeowners for hundreds of years. Beauty and durability combine to create fantastic flooring that is fit for a king, but appropriate in any home. At every step of the renovation process you find yourself at, our team is here for you. Find the right hardwood floors for any room you are renovating, and protect the investment you are making in your home with work performed by our professional installers. Few flooring types provide you with the same level of versatility and ease of maintenance that this flooring type does. When you choose our solid hardwood flooring for your living room or office, you get a surface that is resistant to dust and easily refinished should your interior décor change in any way. Flooring is an investment, and few investments are as well spent as investing in solid hardwood. You want your flooring to last for decades and we are here to make sure that happens. The beauty of hardwood flooring is the fact that it is able to be completely restored when it reaches a point of wear and tear that you can no longer tolerate. Simply have your floors refinished and they will look as good as the day you bought them. These days you need to stretch every dollar while still remodeling your home the way you want, and now you can with the help of our reasonable hardwood flooring prices. Many feel that the stunning look of hardwood is out of their reach. But with the buying power we enjoy as part of a national retail-flooring group, we are able to offer the best hardwood flooring prices to our valued customers. Our available brands include names like Downs Performance™ and Floorcraft™. Get the best fit possible for your unique living space with our precise approach to hardwood flooring installation. Depending on the type of wood flooring you purchase, there are a host of factors to consider when installing hardwoods in your home. 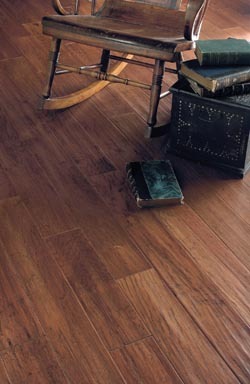 Natural hardwoods react to changes in temperature and moisture by expanding and contracting. You need a team of professionals who have the right tools to install wood floors. When you get the right fit in the room you are renovating, you save money and time on cleaning and care. After your hardwood floor installation is complete, most hardwood surfaces can be refinished and stained again should you redecorate your home again. Avoid the warping and damage that may result from improper installation and take advantage of our professional, proven process. It won’t cost you a fortune to get the job done right the first time. Our technicians are trained and experienced to install both solid and engineered hardwood floors. If the area you want to install wood flooring has more moisture than usual, you are still able to get the look you want with our help. Traditionally, you wouldn’t be able to place wood flooring inside a bathroom or basement, but thanks to engineered hardwood that is a problem of the past. We offer a wide range of engineered hardwood in a number of different finishes. No matter what look you love, you are able to get it in any room you want. Engineered flooring is also ideal for heavy traffic areas. Thanks to modern manufacturing techniques, this flooring is able to stand up to the rigors of everyday wear and tear. Many office buildings choose engineered hardwood to give them the look of luxury and style they desire, while also making sure their flooring is able to stand up to being walked on by hundreds of people every day. Expand the perception of open space in your home by installing our solid hardwood flooring. This natural wood surface is free of the seams and lines that tend to attract unsightly dirt and debris. With our solid hardwood flooring, you get a stunning look from wall to wall that is resistant to moisture and damage. With solid hardwood flooring, you have additional options during the lifetime of your floors. Our solid hardwood surfaces are able to be sanded and stained with ease. If your floors should endure an unusual amount of wear and damage, just have your planks resurfaced and they will look as good as new. If you are looking for a truly original look, consider choosing our hand scraped hardwood. Traditionally, hardwood flooring would be scrapped with a single blade to make sure that it was even and smooth. The hand scraping technique left unique patterns on the wood that modern manufacturing forgoes, so many homeowners have been looking towards our hand scraped hardwood to reclaim the luster of the past. It is important to choose a reliable company if you are interested in hand scraped floors, because the installation process is just as important as the wood itself. Traditionally installed hardwood floors are as much a work of art as they are utilitarian, so that is why you should choose one of our professional artisans who have the skills, tools, and experience to leave you with a lovely design that will truly make your home stand out. If you are ready to find the perfect type of wood flooring for your home, visit us today and one of our professionals will help you every step of the way. Wood flooring is environmentally friendly and lasts for years to come. Contact us to learn more about our hardwood floors. We proudly serve the communities of Highland, Troy, Greenville, Trenton, and the Breese and Carlyle areas in Illinois.